Santa Ana, CA – Mesa Specialty Gas and Equipment, a division of MESA International Technologies, Inc., has announced the completion of its new environmental gas manufacturing line and analytical laboratory located in Santa Ana, CA. “The upgrade and expansion of our environmental manufacturing facilities completes another crucial step in our long term planning” said Mark Tyssee, Vice President of MESA Specialty Gases & Equipment. “The new facilities will allow us to reduce product lead times by shortening specialty gas cylinder preparation time and analytical time, all while improving product quality” Mark added. The new facility showcases a complete line of Rosemount Analytical instrumentation used in the confirming analysis of the specialty gas mixtures. “It was important for us to select a platform that would provide a broad range of analytical capabilities and support options,” said Phu Nguyen, lab manager at MESA Specialty Gases. “The Rosemount Analytical product line is an excellent fit for our requirements” Phu added. MESA International Technologies, Inc. was established on January 1, 1993. MESA Specialty Gas and Equipment, a division of MESA International Technologies, Inc. is a manufacturer and global supplier of highly accurate specialty gas and calibration gas standards used in a wide variety of instrument applications in the laboratory, energy, petrochemical and refinery industries. MESA is strategically located in Southern California near major shipping ports designed to minimize shipping costs and transit time to both domestic and international customers. 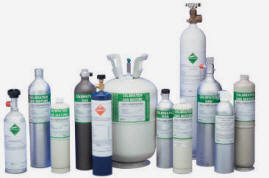 Additional products include instrument grade support gases, calibration gas in small disposable cylinders and gas handling equipment.